As I've mentioned before in previous posts, I LOVE "cat flick" eye-liner and I'd have to say I do this style every day without fail. It's actually got to the point where I feel weird when I'm not wearing it, like I've woken up and forgot to put clothes on! Because this is my "go to" look, that means I've also tested out a lot of different eye-liners on the market and have learned which ones are good and which ones to avoid. Back in June this year, I reviewed the Benefit They're Real Mascara and if I'm honest I wasn't that impressed and would have happily preferred to continue using my £13 pound cheaper mascara from Rimmel instead. It left my lashes looking clumpy and I never felt like it added any extra WOW to my look, unless you consider the near £20 price tag! 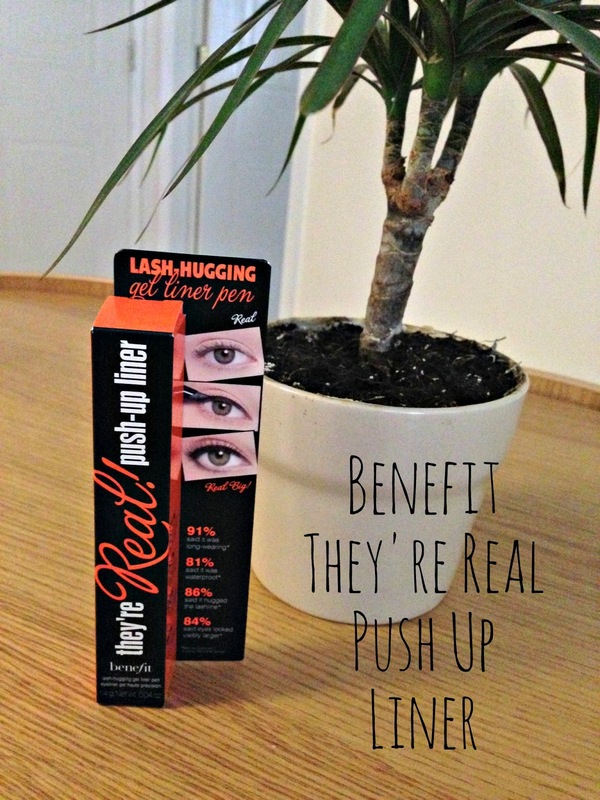 A few months ago though, after the success of the They're Real Mascara, Benefit decided to bring out a follow up product in the shape of the Push Up Gel Liner. Now I had very mixed feelings when I saw this; I was excited as it's a new eye-liner for me to try but then I kept thinking back to the mascara and how much I didn't think it was worth it. Nevertheless, the first chance I got to get myself up Boots, I made sure that the Push Up eye-liner was the first purchase I made. I only tested it once on both eyes and even from that, I could tell it takes a bit of skill to apply this eyeliner. The AccuFlex tip is very difficult to get your head around and although Benefit advertise it as being smooth and "lash hugging", it really wasn't that easy to apply. Another struggle I found was that it seemed to set realllly quick and that there wasn't much space for error without getting in a right mess. Another point that could either be a pro or con (however you want to look at it) but the eye-liner had AMAZING staying power. When it came to taking off the product, it really did put up a fight. I can see now why Benefit released their own make-up remover just for the They're Real products! Although I really wanted to love this eye-liner, I just couldn't. All girls know that getting the "perfect flick" is a skill and I think I've only just mastered it with my normal felt tip eye-liner and trying to use this eye-liner would feel like going back to square one! I won't give up completely though and as I said above, I've only tried it the once so I will be giving it another go and fingers crossed, I will become a lover of it. You can buy yourself one from Boots or from the Benefit website for £18.50. Ooh, that's interesting that the staying power is that good! No matter what liquid eyeliner I use it always seems to run on me and it's just infuriating. I keep wanting to try this and whilst you can get the eyeliner and mascara for about $20 I'm very tempted. I hated the mascara first time round but maybe I could learn to love it? I love their packaging. I might give it a go after I'm finished my Essence liquid eyeliner.